Skills and abilities: Exceptionally gifted magic user with knowledge straight from the gods. Powers: The most powerful sorceress of her time, trained by the gods themselves in the use of magic. She has shown the power of invisibility, shield generation, premonition, precognition with her self made tarot cards, Illusion casting, flight, telepathy, summoning, flight, time travel, she could sense other magic users and their potential. Also noteworthy is her very pure soul allowing her to wield the Sword of Bone one of the cornerstone’s of creation itself. The sword further enhanced all of her abilities exponentially. Asahake is also the Sorceress supreme of her time making her the strongest magic user of her time. 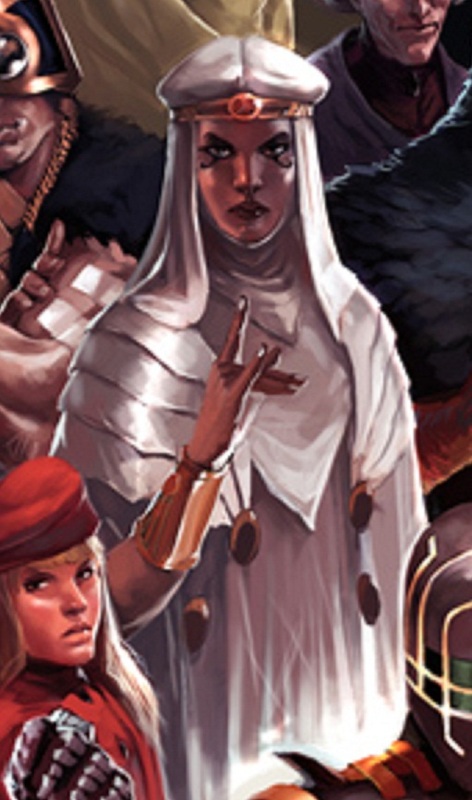 Ashake is the first woman with Blue eyes and white hair in the bloodline of the X-men’s Storm, she is Storm’s earliest known ancestor.